POOLS ARE EVERYWHERE THESE DAYS! 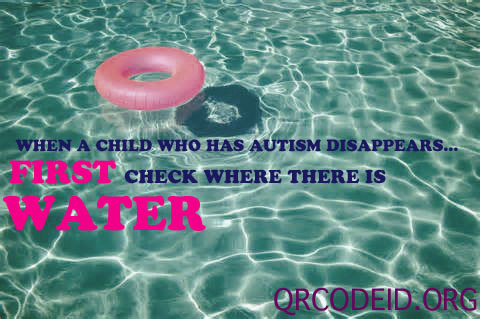 When someone with Autism wanders drowning is a major concern. You Can use Google Maps to see where swimming pools and other bodies of water are in your neighborhood. * Practice logging in and changing your profile info in real time so that in an emergency you will be able to update your status quickly. *Additional information can be special medical, safety and behavioral concerns. *Set up your secure password protected site. This can be seen when you or anyone you give the extra password to view the profile, but not from the code being scanned by a non-member. You can keep important info here that you may want to access in an emergency, or practical info you might want your babysitter to see. *Have your loved one wear the code and practice standing still while you scan the code. This will help them know what to expect. If they can point to the code, or ask for it to be scanned this will be even better. *Cover a few numbers of code, or just crinkle the fabric when taking a picture of the person, so that it cannot be scanned from wherever the picture gets posted.